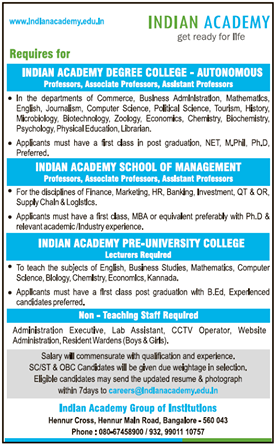 Indian Academy Group of Institutions, Bangalore has advertised in DECCAN HERALD newspaper for the recruitment of Professor/Associate Professor/Assistant Professor jobs vacancies. Interested and eligible job aspirants are requested to apply with in 7 days. Check out further more details below. About College: Indian Academy Education Trust (IAET) was established by Dr. Thummala Somasekhar, who is a visionary academician and a dynamic leader. The Trust’s vision of offering top quality higher education solutions is ably nurtured by dedicated and accomplished trustees. Systematic execution of long cherished plans resulted in the establishment of many educational institutions in the last two decades. These institutions aim to impart formal, full-time education, are duly recognized by the State and Central Governments, and have been established and approved as per the guidelines of Statutory Bodies.